Sowbugs and pillbugs are crustaceans more closely related to shrimp and crayfish than to insects. Other names used for these very common animals include rolypolies and isopods. Sowbugs and pillbugs live in damp habitats where they feed on decaying vegetable matter. Outdoors, these scavengers are found under dead leaves, rocks, boards, grass clippings, flower-bed mulch and other objects on damp ground. Dark, damp areas of the house may become breeding sites for sowbugs, although sowbugs found indoors are usually accidental invaders from outside. Sowbugs do not bite or sting and cannot damage household furnishings. They are a nuisance only. 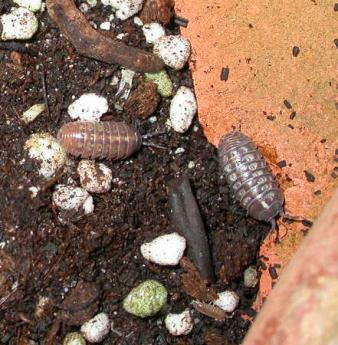 Sowbugs and pillbugs must have moisture to survive and die quickly if there is not a damp location where they can hide. Occasional annoyance by sowbugs should be tolerated; invaders can be vacuumed, swept or picked up and discarded. Persistent problems will require locating the sources of the sowbugs and eliminating or treating these areas. Sealing foundation, door and window cracks and gaps where the sowbugs enter may be sufficient for control. Indoors, moist hiding places should be removed or modified by correcting water problems, improving ventilation or other humidity control measures. Residual insecticide treatment may be used both indoors and outdoors for sowbugs. Outdoor insecticides can be applied around the house to breeding sites or as a barrier. The treatment must be applied with enough water to get the insecticide down to the soil surface. For more information on outdoor insecticides please see this article. Light application of residual indoor insecticides to cracks and corners of infested areas may be of some benefit. For more information on indoor insecticides please see this article.